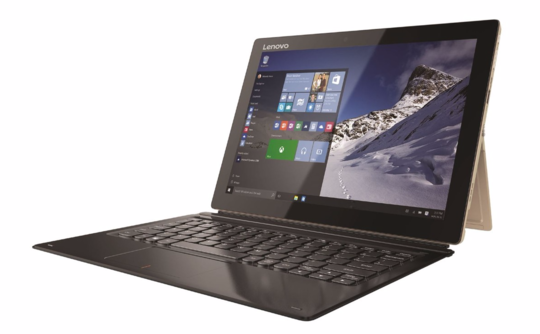 The Lenovo Miix 700, which is an affordable, lightweight and powerful hybrid capable of becoming the best 2-in-1 on the market. The Lenovo IdeaPad Miix 700 is a gorgeous 2 in 1 designed for the on the go consumer, who demands hardware that excels at work and play. The Miix 700 characterizes a slim, detachable keyboard cover that can prop itself up via magnets in the tablet’s bottom bezel. The Miix 700, which can be outfitted at 8GB of RAM, which will not utilize Intel Core i processors. Instead, Lenovo opted for the new sixth-generation Intel Core M series of processors. The fan-less Core M processors, which come in three types allow the unit to operate without a cooling fan, but do not pack as much power as the Core i series. Lenovo bested Microsoft by including an optional 4G LTE modem. The Surface Pro 3 does not include a mobile broadband modem, so if you crave portable internet, the Miix 700 is a better investment. Sadly, we do not know what the Microsoft Surface Pro 4 will have as a CPU, but the entry-level Surface Pro 3 comes with a fifth-gen Broadwell Core i3 processor that clocks in at 1.5GHz. So, at least when it comes to clock speed, the Miix 700 could be a good deal faster than Microsoft’s current flagship hybrid. The Miix 700’s faux leather detachable keyboard features a silver colored dual watchband hinge. At the device’s rear you will find the kickstand, which tucks away nicely into the device’s body. The kickstand spans almost the length of the case and adjusts to allow you to set the height of the display at any angle from 95-135 degrees. Like the Surface Pro 3, the Miix 700’s keyboard cover is super thin and a pleasure to use. It characterizes chiclet style keys, faux leather palm rests and a flat plastic track-pad that are a delight to touch and operate. Lenovo bested Microsoft by including an optional 4G LTE modem. The Surface Pro 3 does not include a mobile broadband modem, so if you crave portable internet, the Miix 700 is a better investment. There is no doubt that the Miix 700 is a venerable challenger for best hybrid laptop.